On Monday my wife, dad and I went on the Disney Backstage Magic tour which takes you on an all-day tour of the park behind the scenes. 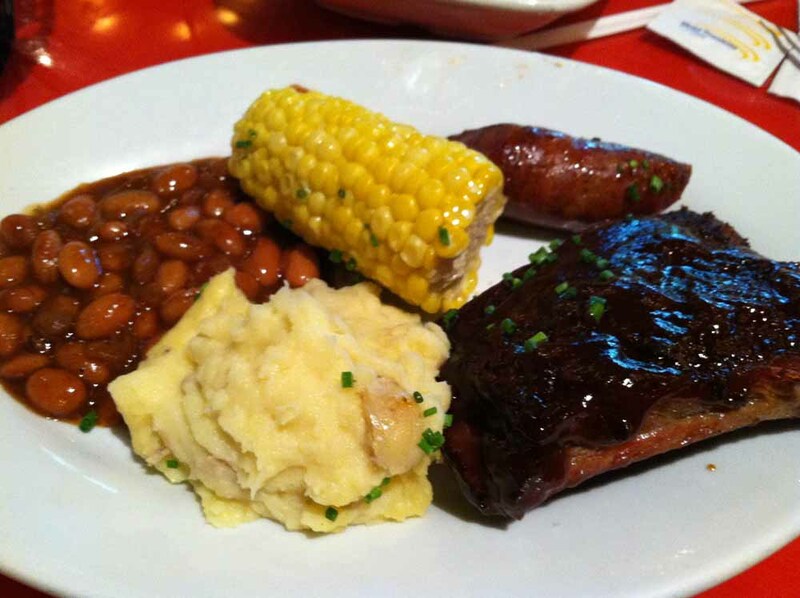 Since it really does last all day they stop at a place called Whispering Canyon Cafe in the Wilderness Lodge hotel that’s got a real country western theme. They’ve got a regular menu, but also a family style barbecue thing where they bring big plates of food to your table and you all just dig in. As it turned out, there were the perfect number of people on the tour to fill three big tables and then one with just three people. We were that table of three which was great because I don’t like the idea of other people accidentally touching my food. Anyway, the food itself was pretty great. The menu describes the Family Platter as including “Kansas City-style Smoked Pork Ribs, Herb-baked Chicken, Hand-carved Oak-roasted Beef Strip Loin, Citrus-crusted Market Fish, Western-style Sausage Sides fro Sharing: Seasonal Farm Fresh Vegetables, Herb-crushed Yukon Gold Potatoes, Cowboy-style Baked Beans, Corn on the Cob.” I’m pretty sure we didn’t have fish or beef stip loin, but the ribs were fall-off-the-bone cooked and super tasty but the real star of the show was that sausage which I could have eaten a whole plate of. I’m not sure if a huge heavy barbecue lunch is the best idea when doing a Backstage Tour, but it was tasty. For dinner we ate at a restaurant called The Wave…Of American Flavors in the Contemporary Resort. I feel like I kind of screwed up while eating at The Wave. 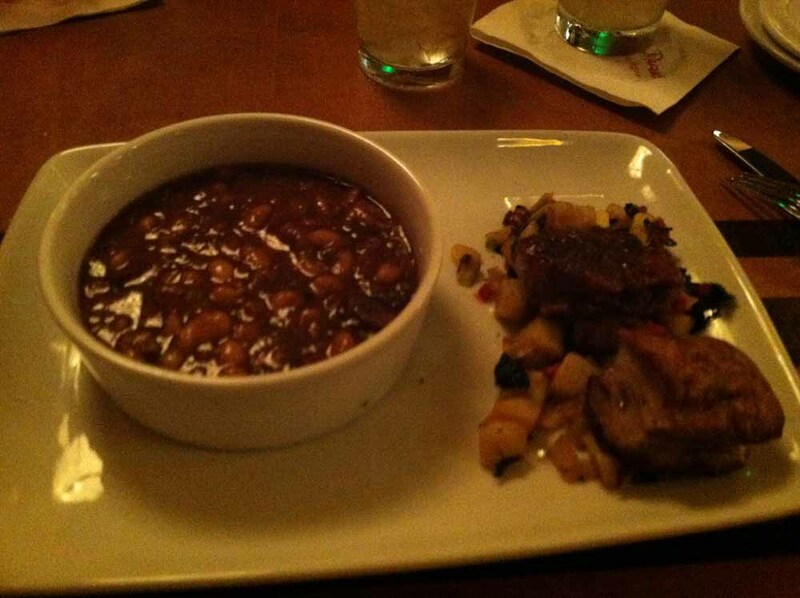 While my family went with some fancy steaks, I decided to try the “Thompson Farms Naturally Raised Pork Belly and Tenderloin with White Bean Cassoulet and Locally-sourced Vegetables.” What drew me to this dish is the fact that so many chefs and food personalities that I like and appreciate say that pork belly is supposed to be one of the best foods around. Unfortunately it didn’t do a whole lot for me and just kinda tasted like fatty bacon. It wasn’t bad and I didn’t really know what I was expecting, but it didn’t exactly send fireworks through my brain like in Ratatouille. However the tenderloin — small as it was — was fantastic as was the cassoulet, though I wound up passing that to my daughter who really loved it. Since the Disney Dining Plan comes with dessert (I’d personally rather have an appetizer, but I’m a team player) I had a lot more dessert during that vacation than I normally would. 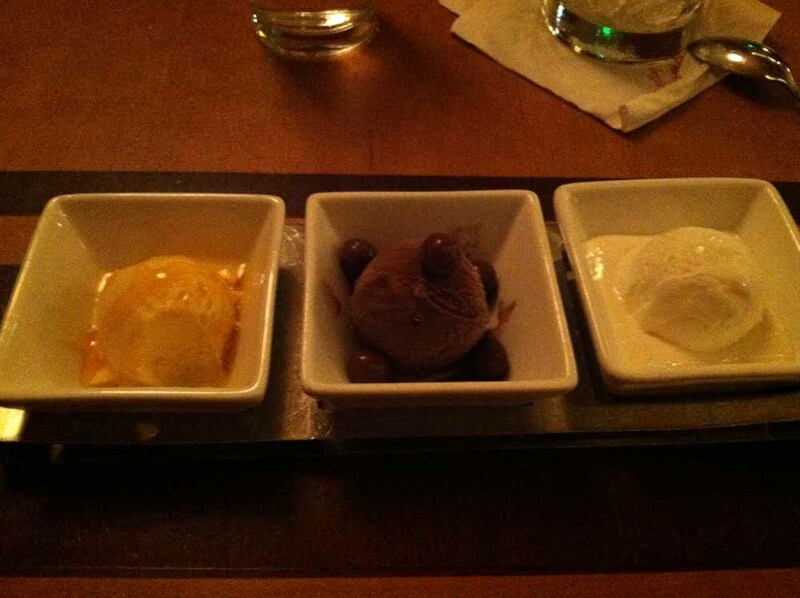 The desserts at The Wave are pretty neat because they all come in little tiny dishes and you get three of them. I went with “Our Spring Gelato Trio: Mandarin Orange Gelato, Chocolate Malt Gelato, and Toasted Marshmallow Gelato” because I didn’t want to pile it on too heavy. And it was actually really tasty. My favorite was the marshmallow gelato because it really did taste like toasted marshmallows which are one of the desserts I really enjoy. Thanks, I actually just switched themes. I have no design experience, I just use the free Word Press themes, but there’s some cool stuff on there.